Garage Door Radio Receiver and Transmitter Set replaces or adds to a garage door opener. 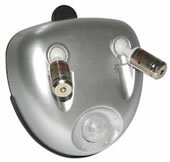 Individual transmitter can be ordered. Call with your brand and model of exiting remote. The Wireless Garage Door Alarm (GDA) provides security and protection for valuable garage contents by a loud audible siren during a break-in. It is also used as an "open door" indicator. The GDA easily mounts on overhead doors for home garages, rental garages (even without electricity), warehouses, commercial buildings, strip mall shipping doors, and storage buildings. Dual Laser Parking System You set a bright red laser beam to target a preselected spot on or in your vehicle for precise parking every time. Laser is activated by the motion of your car entering the garage, and mounts easily to garage ceiling. Prevents costly repairs to your vehicle and garage. Laser Parking Systems can be used for one or two cars. 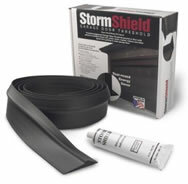 Storm Shield Garage Door Threshold easily applies to concrete garage floors. Keeps moisture, dirt, cold air, leaves, and pests out of your garage. It can also reduce heating costs in attached garages. Professional Grade Garage Door Lubricant, Use what pros use. This lubricant eliminates those annoying squeaks and rattles in your garage door. 9 oz. Sensor Guards are made to fit over garage door photo eye sensors,A protecting the sensors from being bumped out of alignment. These garage door sensor guards are easy to install to on the door track or frame. Sold in pairs. Universal Replacement Photo Eyes These photo eyes have a self-programming feature which allow the installer to simply hook up the beams to the existing wiring, mount the units to the wall and the job is complete. Non-polarized for even simpler installation (so there is no way to hook them up backwards).